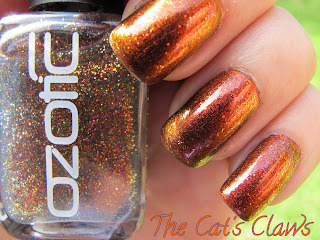 Its with great sadness that I hear that Ozotic Pro are discontinuing their 500 series of holographic polishes! And yet one of their most beautiful is Ozotic Pro 513 a lovely burgundy wine colour. When I did my mani last weekend I didn't realize just how busy my week was going to turn out, consequently what your seeing here is a seven, yes I said seven! day old mani. And only the slightest bit of tip wear to show for it. 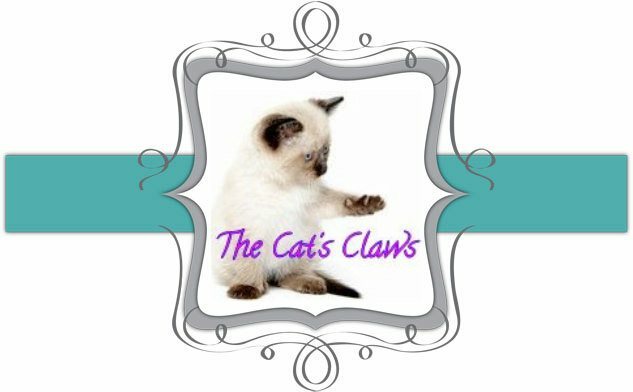 So how does my mani last so long? Well always base coat Fabulous Triple Tough Power Gel, (painted on the underside of my tips as well) Two coats of China Glaze Draped in Velvet which is actually a teensy bit more pink than the Ozotic Pro 513. Two coats of Ozotic Pro 513 and then I think it was one possibly two coats of Seche Vite. The "Arty Shot" where I was hoping to show the two polish's having the same base colour, even though this shot was taken in the shade there is still an awful lot of light bouncing off the holographic particles in the Ozotic Pro. And a bonus shot because the holographic Ozotic Pro 513 is so pretty! Lynnderella Love Potion No99 let me tell thee how much I love you! Well its purple for a start and not just any old purple either, a purple that changes from pink/purple to blue/purple! How gorgeous is that? Its GLITTER, which of course is a plus. And, and its just too gorgeous for words, so the pictures can do the talking instead! 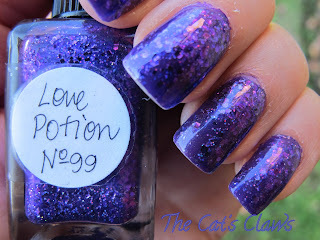 This was two coats of Lynnderella Love Potion No99, I intentionally put most of the glitter near the cuticles and only a small amount near the tips. In real life it looks like my nails are evenly covered in glitter, I thought this way might just make the glitter removal process that teensy bit easier! But I'm not holding out much hope. So onto the undies, I used two coats of Ultra3 Spring Break a nice purple cream, which isn't really that glossy when dry. 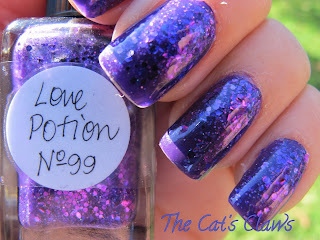 Followed by two coats of Lynnderella Love Potion No99, and three coats of Seche Vite to make it all glassy smooth. 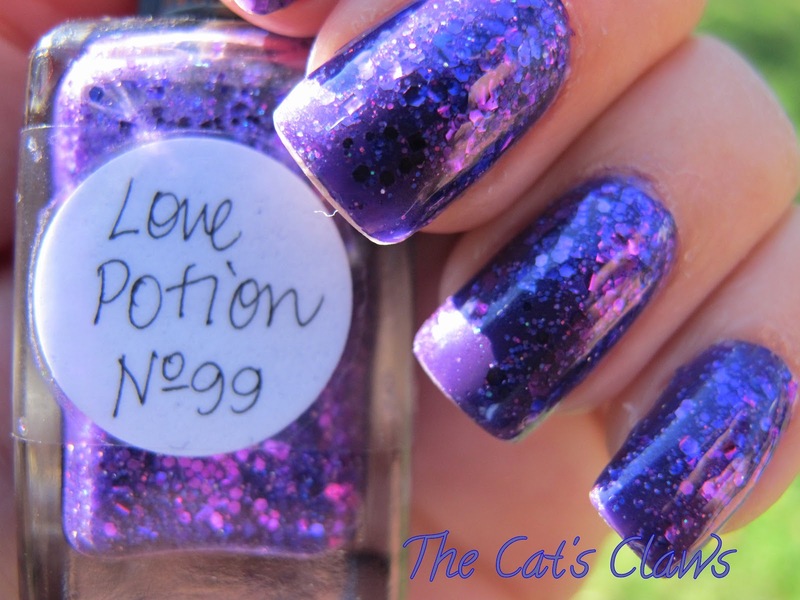 And in the shade Lynnderella Love Potion No99 loses none of it's potency! 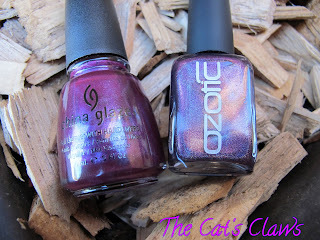 If you read my last entry you will know I recently bought two Ozotic Pro polishes whilst ordering for my sister in the UK. 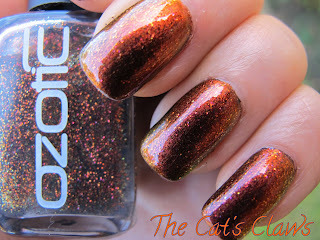 Well this is the second Polish I ordered for myself, Ozotic Pro 530. It has the same colour shift as the 520 but as a glittery finish, with the added bonus of pink specks in it. 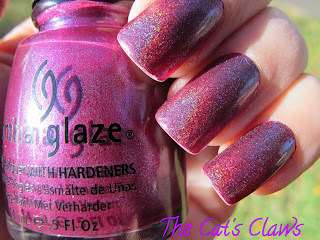 I layered this over my previous Ozotic Pro 520, Ultra3 Chocolate Cake mani. And I must just say, I think you can have too much of a good thing! 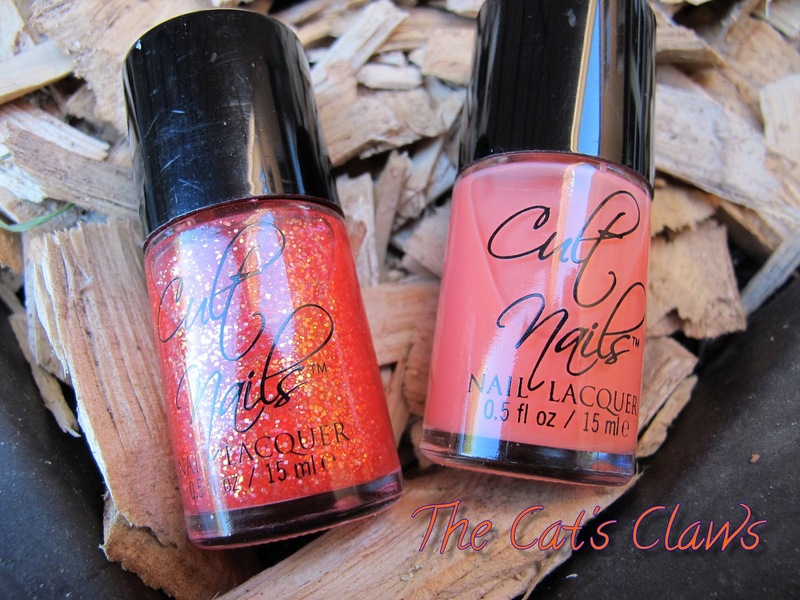 As I absolutely loved my Ozotic Pro 520 mani, but layering on the 530 killed it! 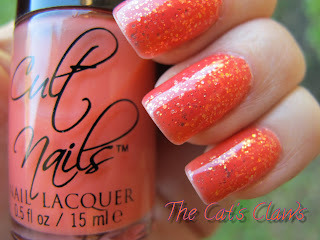 I still think this is a pretty polish though, but in future I will be wearing it over a plain cream for maximum effect. So here we have Ozotic Pro 520 a multi chromatic polish, colour changing between orange, red and gold. 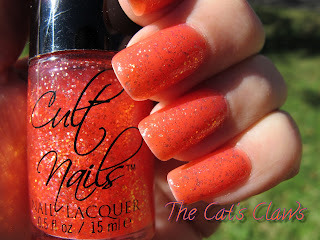 This polish is soooo pretty and I don't know why I haven't bought it before now. This colour has also jumped straight on to my favourites list. The colours remind me of Autumn leaves and in the sunlight my nails look like molten metal with the strong colour change going on. And a picture in the shade where hopefully you can see the pinky brown and orange shift going on. Its Official, I'm In Love With The Butterfly Effect! 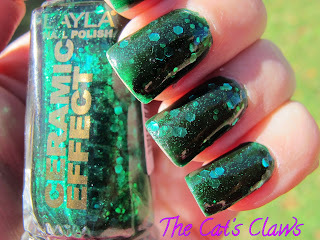 This is Layla Ceramic Effect The Butterfly Effect in the shade. 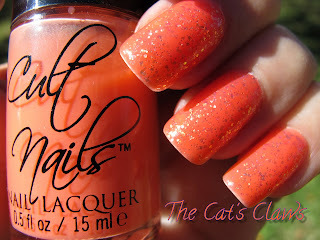 If you loved Max Factor's Fantasy Fire then you will love this too! It looks like Max Factor's Fantasy Fire's big sister. Layla Ceramic Effect The Butterfly Effect has exact same colouring as Max Factor's Fantasy Fire but as flakies rather than sparkles. And could I take a bad picture? No! So we have therefore many, many photos to scroll through, sorry. This is three coats of The Butterfly Effect over one coat of Kleancolor Metallic Purple, followed by the obligatory one coat of Seche Vite. 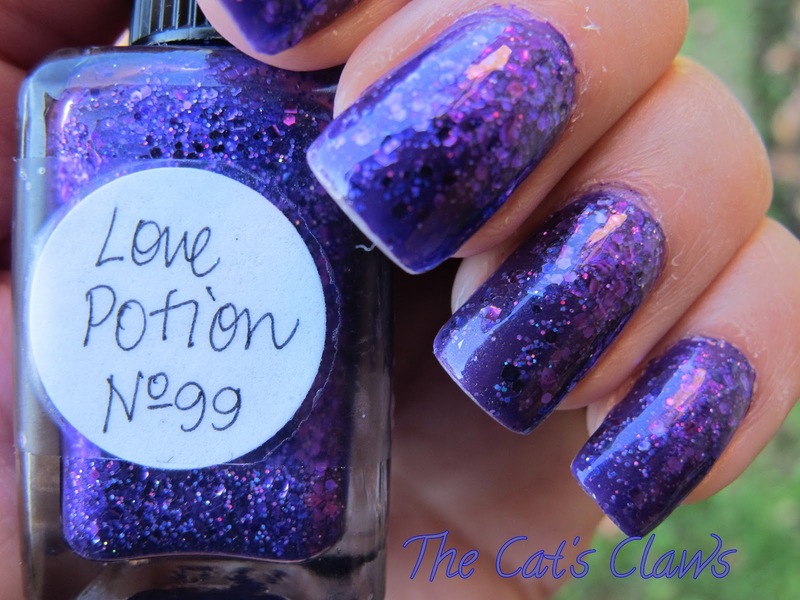 The colour is a blue toned purple, with flakies that turn from red to gold to green. I adore the bottle shapes too, they are soooo cool. 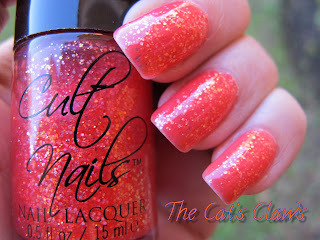 I can safely say that this is the one bottle of polish that I NEED the regulatory five squillion bottles of backups! And the following bonus pictures taken in the shade show the flakies to their best advantage. How perfect is this red? And it is so well named, let me introduce you to Layla Ceramic Effect Killing Red! A red to gold flakie in a red suspension. 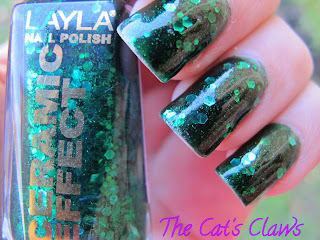 Cathy of More Nail Polish kindly arranged a buying spree at Layla, so this is not the only polish I acquired and they are all so beautiful. I'm afraid the weather has been so overcast that I haven't been able to take pictures for a couple of days, consequently I am showing tip wear. This is two coats of Layla Killing Red plus one coat of Seche Vite. And I used one coat of OPI Big Red Apple as undies.